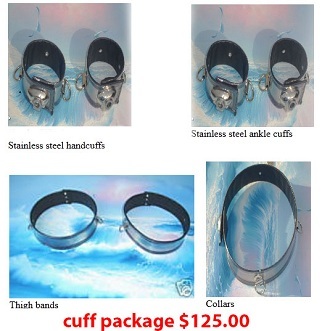 This package deal includes our stainless steel handcuffs, ankle cuffs, collar, and thigh band. All items have 3 D-rings on them, and are keyed alike. All items will be custom made for a perfect fit. After you place your order we will need you to email us back with a circumference measurement of your wrist, ankle, neck, and thickest portion of your thigh.